EDMONTON, AB – Edmonton’s newest microbrewery, Yellowhead Brewing, was officially opened this past Wednesday May 19th, and in honour of an ancient brewing tradition, Reverend Neil Gordon of All Saints Cathedral was brought in to bless the brewery in exchange for the traditional payment of four pints. 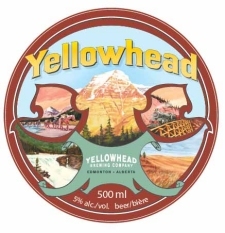 Owned by Leon Hunter and located in the space that once held the now defunct Maverick Brewing, Yellowhead shares the name of Edmonton’s first brewery which was founded in 1894 and named for the Yellowhead Pass, a mountain pass used by early settlers to travel from Alberta to the BC interior. The first Yellowhead brew is Yellowhead Premium Lager, a Helles-style beer inspired by the training taken by brewmaster Scott Harris at Doemens Technicum in Munich, Germany. The beer is currently available exclusively on draught, but should be available in bottles later in the summer. Just two small corrections on your post about the new Yellowhead Brewing in Edmonton. Joel Hunter is simply the communications and sales rep for the brewery. It is owned by local developer magnate Gene Dub, who also owns the building in which the brewery is housed. Second, and this mistake is the brewery’s fault, Edmonton’s first brewery was not called Yellowhead. It was called Edmonton Brewing and Malting Company, and its initial BEER was called Yellowhead. Splitting hairs, I know, but I thought a quick correction would be warranted. Thanks for all your hard work keeping the world up to date on Canadian beer news. Sorry – Mr. Hunter’s name is, indeed, Leon. My mistake in the first comment. Apologies. Jason – thanks for the corrections. I took the info about Hunter being the owner from an article about the opening that referred to him as such. I find it very refreshing when a brewery doesn’t launch with a lager, but I guess that would be a risky proposition in most of Canada. Actually, Yellowhead did launch with a Lager, an extremly good lager at that. This beer was so good 6 months in my fridge later. Gimme more! please!